There’s something very special about wandering over an ornate Japanese bridge, basking under the shade of a cherry tree or enjoying a cup of green tea overlooking an ornamental lake. For many, a visit to a traditional Japanese stroll-garden proves a highlight to a trip to Japan. But the good news is, thanks to their international and inspiring popularity, these gardens can be visited all over the world. We got so much great feedback from readers with your recommendations that we have added some more of your favorite US Japanese gardens. So if you’re searching for a little Edo-tranquility, then look no further — here are our 12 stunning Japanese gardens in America. Described by the former Ambassador of Japan to the US as ‘the most beautiful and authentic Japanese garden in the world outside of Japan', this stunning urban oasis overlooks the city of Portland. Designed in 1963, it includes five different garden styles, which are designed to express serenity, tranquility and the aestheticism of nature. Immerse yourself in some Japanese culture in one of their cultural demonstrations, or take a walk through the Strolling Pond Garden. To see more of the beauty of Portland Japanese Garden, check out our Complete Guide! Hours: (Until March 12) 10am to 4pm Tuesday to Sunday, 12pm to 4pm Mondays. (After March 12) 10am to 7pm Tuesday to Sunday, 12pm to 7pm Mondays. Check here for further details. The Japanese Tea Garden in San Francisco is place for some quiet contemplation, and a little American history, nestled in the Golden Gate Park. Enjoy some green tea and mochi or take a stroll across the (very steep!) ornamental bridge, in what is the oldest public Japanese garden in America! The garden was originally created as a Japanese Village exhibit for the 1894 California Midwinter International Exposition, to showcase Japanese gardening skills. After the fair ended, the garden was thankfully kept open, to allow Americans to marvel at its original pagodas and native Japanese plants for over a century now. Open: 9am to 6pm from March 1 to October 31. Closes at 4:45pm in winter. See here for more information. Take it easy and enjoy this green gem in the heart of Seattle, with its winding paths and pretty benches encouraging mindfulness and a sense of calm. One of the more well known Japanese gardens in the US, it is bursting with those typical accoutrements you’d expect to see in a traditional garden in Japan — from lanterns, bridges, Japanese maples and pretty lakes — enjoy the changing seasons within this gorgeous urban sanctuary. Hours: From March 1, 2018. Check here for further details. Japanese architecture doesn’t get more authentic than the Shofuso Japanese House in Philadelphia, which was built in Nagoya, Japan, and transplanted to its current location in 1953. 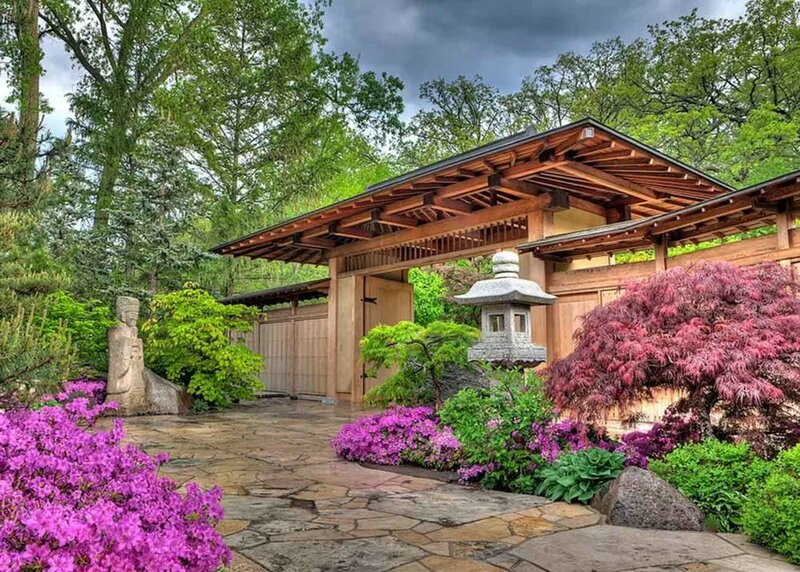 Today the house is surrounded by several excellent examples of Japanese garden design, including a courtyard garden, and large hill garden, and a charming tea garden. The house also functions as a art gallery; you can enjoy for instance the nihonga-style paintings of Hiroshi Senju on the building’s fusama, or sliding screens. Open: Reopening from March 24. 10am to 4pm Wednesday to Friday, 11am to 5pm Saturday and Sunday. Closed on Monday and Tuesday. See here for more details. 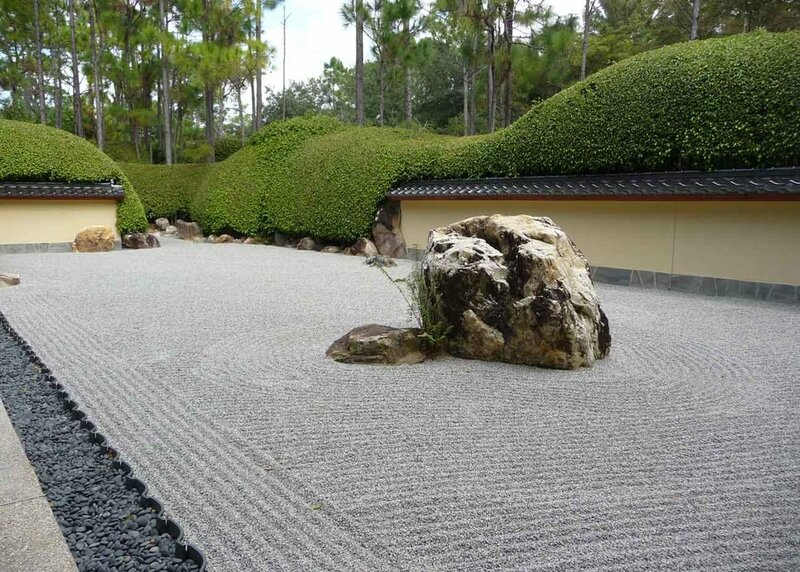 Bask in the open space of the beautiful Japanese gardens of the Morikami Museum, Florida, with its bonsai collection and traditional tea house. Its six gardens are directly inspired by famous gardens from Japan, including the Shinden Garden, Hiraniwa Flat Garden and Karensansui Late Garden. The Japanese theme continues with a roster of exhibition and workshops, exploring calligraphy, Japanese textiles, kimonos and more. Hours: 10am to 5pm Tuesday to Sunday, closed Mondays and holidays. Check here for further details. Time seems to stand still in the zen-like atmosphere of the Elizabeth Hubert Malott Japanese Garden Chicago, part of the city’s Botanic Garden. With half-buried, moss-covered rocks and weathered pine trees, you’ll feel like you’ve stepped back in time. Visitors love the stunning array of flowers and trees that the garden has to offer; it’s worth going back throughout the year to see the glorious changes in color as the seasons roll on. Open: 8am to 7pm. Click here for more details. Otherwise known as the Garden of Water and Fragrance, the fundamental style of the of the Suiho En Japanese Garden in Van Nuys is known as Chisen-Kaiyushiki, or wet garden with promenade. Designed as a traditional strolling garden, the carefully laid-out path which transports the viewer across the different landscapes, allowing you to enjoy multiple views of the lake and its surroundings. Like many Japanese gardens, its been designed so that each season brings to life another aspect of the flora - from the vibrant fall foliage, to the spring blossoms and blooms. Open: 11am to 4pm Monday to Thursday, 10am to 4pm Sunday. Closed on Thursday and Friday. The garden is affected by rain, so check the website on rainy days. See this page for more info. Inspired directly from the Portland garden, Anderson Japanese Garden was opened in Rockford, Illinois in 1978. With its stunning beds of colourful plants, along with traditional stone sculptures and lanterns, you’ll feel like you are in Japan in no time. In particular, don’t miss the mesmerising fall colours at this brilliant garden. There are also lakes full of the iconic koi carp, with pretty waterfalls and scenic bridges. Hours: 9am to 6pm Monday to Friday, 9am to 5pm Saturday and Sunday. Check here for further details. 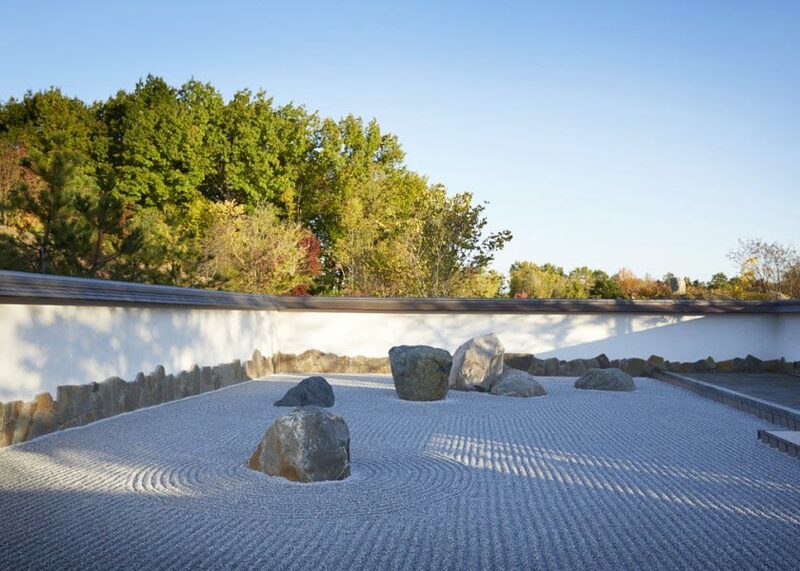 In the heart of Michigan, traditional Japan meets contemporary sculpture in the charming Japanese garden in Meijer Gardens & Sculpture Park. Having long appreciated the beauty of a traditional Japanese scenery, the founders of the gardens decided to incorporate one of their own into the wider site. The result is this patch of tranquility, combined with modern sculpture from some of the world’s greatest artists: think Jenny Holzer and Anish Kapoor. A real sight. Open: 9am to 5pm Monday to Saturday. 11am to 5pm Sunday. Check here for further details. 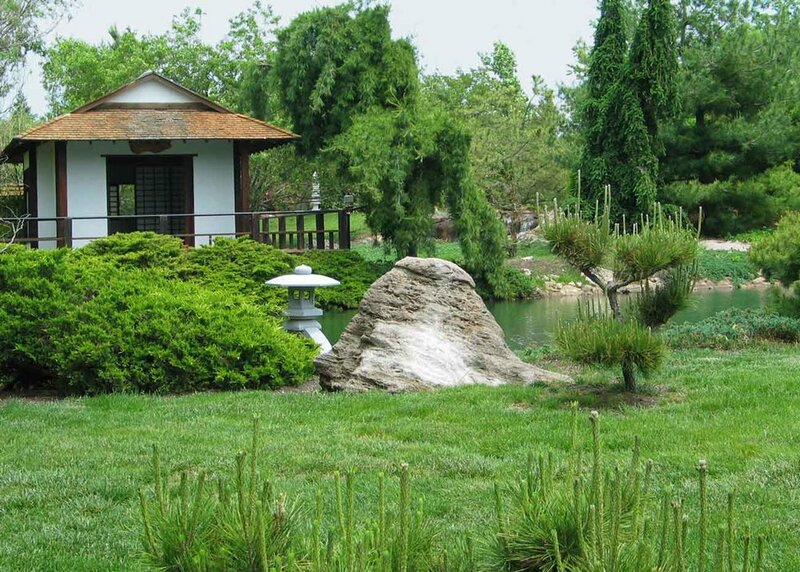 Created in 1985, the Mizumoto Japanese Stroll Garden is one of Springfield's best-kept secrets. This gorgeous and beautifully maintained garden includes a large lake full of koi carp, a meditation garden and a tea house, all within a traditional stroll garden, typical of the Japanese aesthetic. Visitors laud the garden's peacefulness and tranquility, so why not head there in the afternoon when it's a little quieter, follow the path around the garden to take in all the scenic sites, and make sure you don’t miss the elegant moon bridge! Open: 10am to 7pm from April 1. See here for more details. This 14-acre Seiwa-en Japanese Garden in St Louis, Missouri, enjoys a sparkling carp-filled lake, stunning maple trees and traditional bridges and lanterns. The garden defines itself as a space of monochromatic understatement. The idea less is more, typical of Japanese garden design, permeates the space. Rather than focusing on showy flowers or ornaments, concepts of openness and mindfulness are crucial to its character. The result is a spacious, calming and beautiful environment. Not to be missed! Open: 9am to 5pm. See here for further details. Last but not least, don’t miss the wonderful sakura at the gorgeous Japanese park in the Brooklyn Botanical Garden, which from March envelop the space with its enchanting pink blush. This is one of the oldest Japanese gardens in America. Check back here to see when the flowers start to bloom this year. Surely a must for any cherry blossom or Japanese garden fan close to New York City! Hours: (Until March 1) 10am to 4:30pm Tuesday to Sunday. (After March 1) 8am to 6pm Tuesday to Sunday. Closed Mondays. Check here for further details. So what are you waiting for — combine the great outdoors with a little Japanese serenity at one of these beautiful sites! 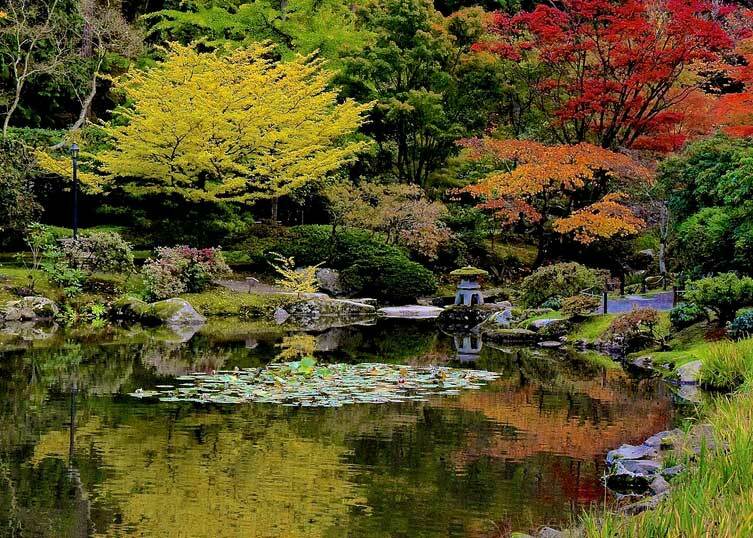 Which is your favorite Japanese garden in America? Let us know in the comments below.